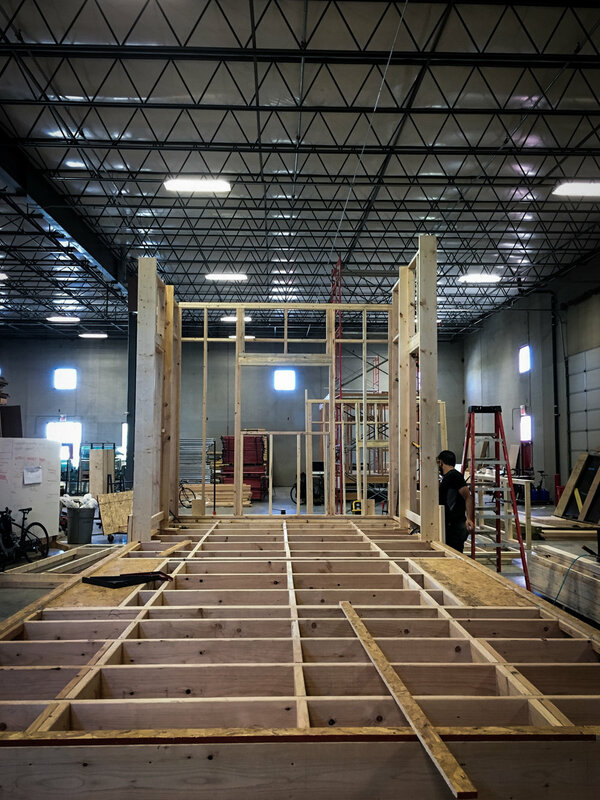 The process of sheathing the tiny home was conducted with material optimization and ease of construction as top priorities, using full OSB sheets where possible and minimizing cuts on all other sheets. We used 48"x96"x.4375" OSB sheets and secured them with 1.25" drywall screws. 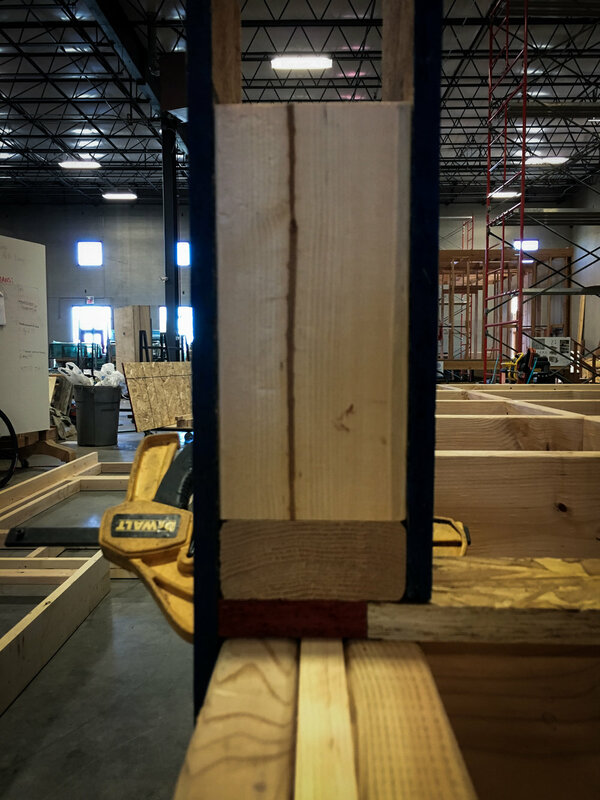 The exterior sheathing brought an impressive level of lateral stability to the tiny home structure; the tiny home now has no sway or deflection, as it did before the sheathing was applied. Panels on the walls were staggered and oriented horizontally in order to 'bind' 4' framing modules together, giving added stability to the wall framing. 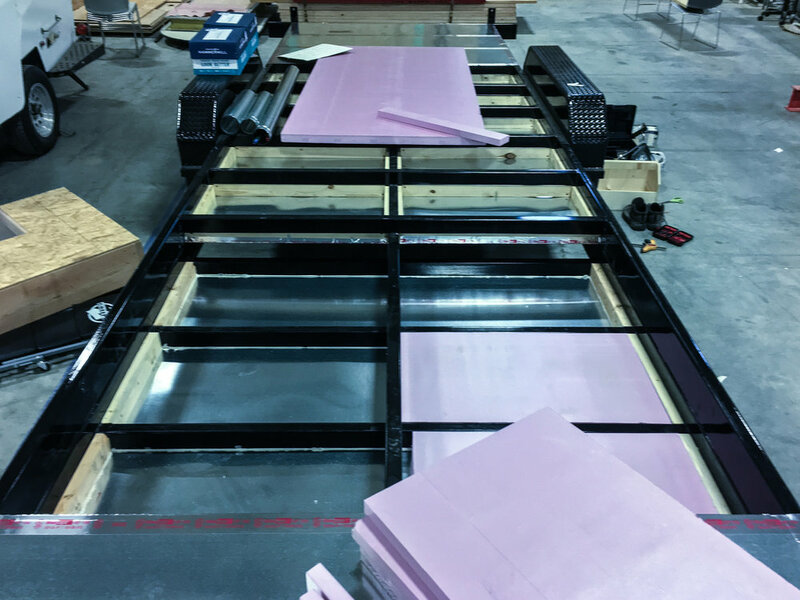 The same principle was applied to the roof, with panels staggered and oriented in the long direction of the roof to 'bind' framing modules together; however, we used .5" thick panels as we rafters were 24" on-center. This logic breaks occasionally, such as at the South wall, where the panels around the window were sized to line up with the clear opening, using the largest panel sizes possible and avoiding complicated cuts. At the perimeter of each sheet, screws were applied on 8" centers, while screws were applied on 12" centers in the middle of the sheet where vertical studs were located. Smooth face of OSB oriented to the exterior face was a mistake but not a fatal one. The other side of the OSB is rough and has vertical and horizontal lines for nailing and screwing lines (we now know that). 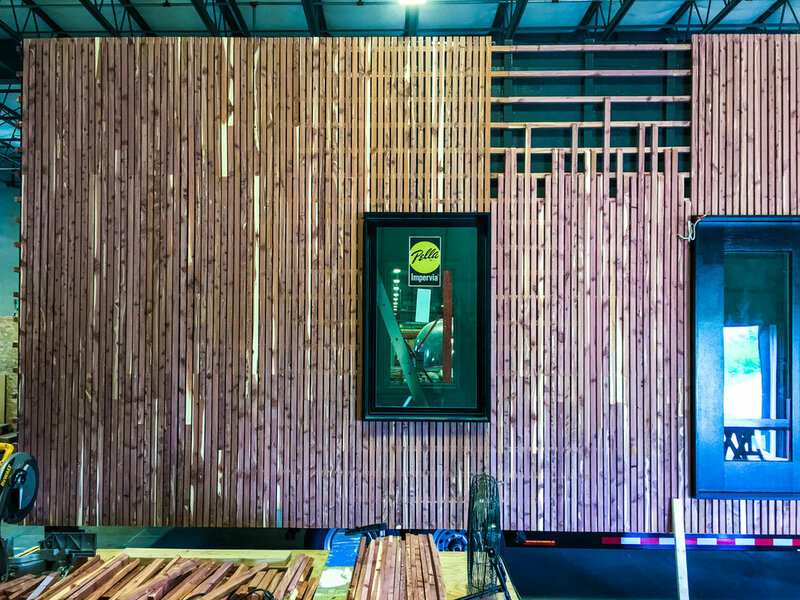 The exterior sheathing for the walls and roof was applied in a single day with three people. The use of ladders and scaffolding were essential to the safe and clean installation of the wall panels, while a forklift was very useful in getting OSB sheets safely onto the roof. 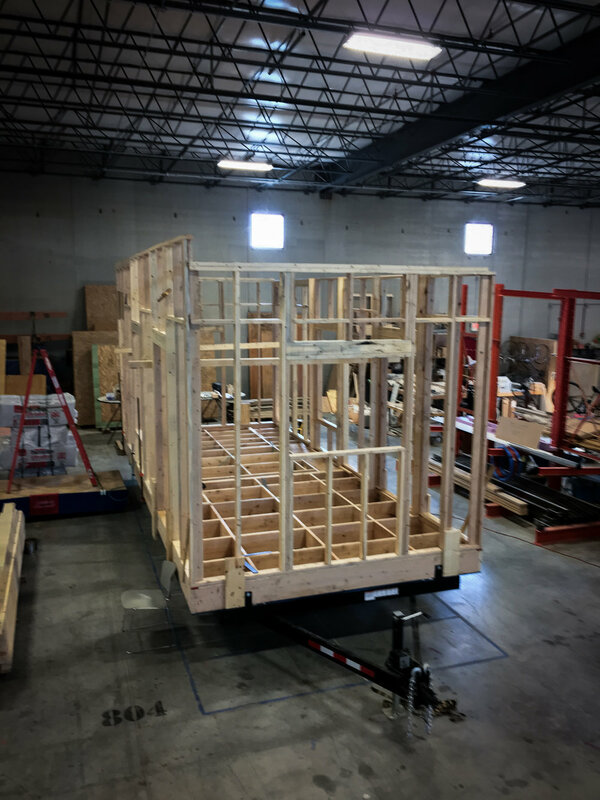 The installation of the sheathing gave us the first sense of interior enclosure within the tiny home. The space was surprisingly much as we had imagined it, and the amount of light permitted by the window and door openings seemed highly conducive to the sense of openness and natural lighting we had intended. For the roof sheathing, we used sheathing clips. 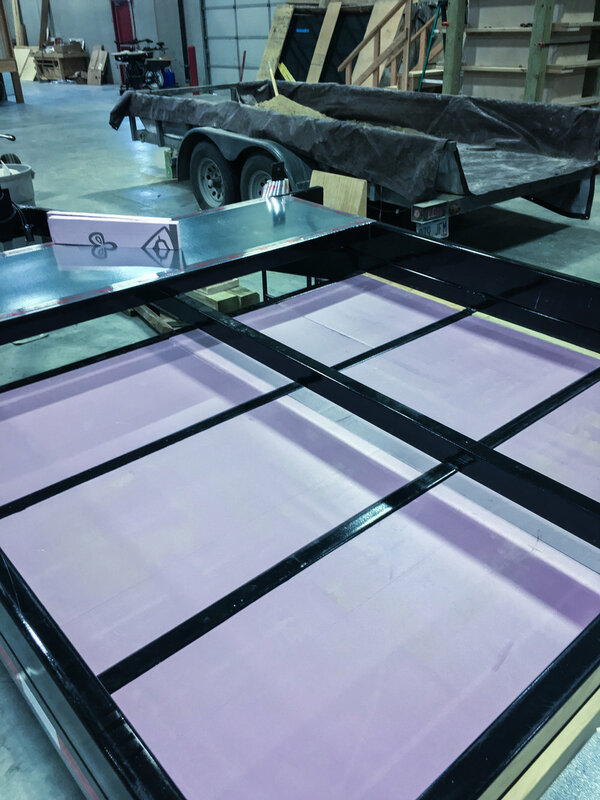 They helped in aligning the panels in both direction and maintain consistent expansion gaps. In hindsight, using clips on the walls would be a highly recommend process. The clips also help secure on panel to another for added wind assisted panel tear. 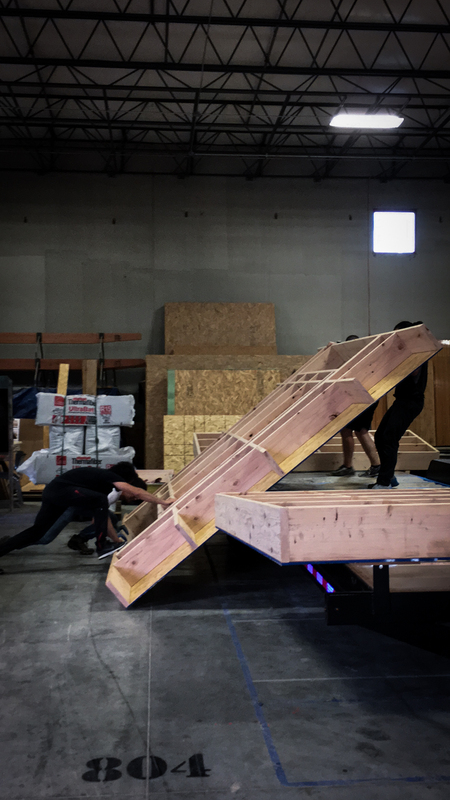 The framing of the roof was the most challenging tiny home construction exercise to date; this was due primarily to the unique geometry around cutting and the need to be elevated during installation. Our friend, Ian, spent an entire day with us installing and troubleshooting the roof framing. Kadim had done all of the cutting of the rafters the day before. While we did have scaffolding, a fork lift, and ladders available to us, the process of installation was considerably ad hoc, and we finally developed confidence and the best installation methods by the time we reached the final roof rafter. Ian was rightfully skeptical of Kadim's temporary lateral bracing techniques. Considerable attention to detail was required in order to install and align the roof rafters in coordination with the 2x10 columns. Again, the skepticism. Again, justified. The roof installation at the loft end was reasonably smooth, due to the fixed, elevated surface that could allow the roof connections to be easily accessed and managed. 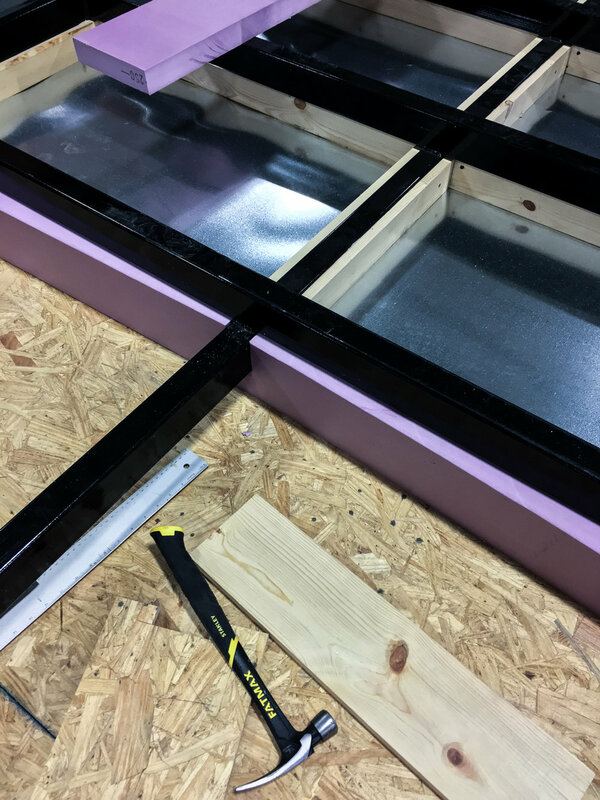 The floor surfaces had not yet been installed in the other parts of the tiny home, so coordinating ladders and tools was one of the largest parts of the roof installation effort, not to mention elevating each 2"x6"x10' roof timber. Strategizing, and probably exchanging snarky remarks. Before the installation of the rafters, the walls were considerably insecure; one good push and pull would have the entire house swaying. However, once the rafters were installed, the entire skeleton became much more rigid, and we expect that the exterior and interior sheathing will give it full rigidity and structural soundness. 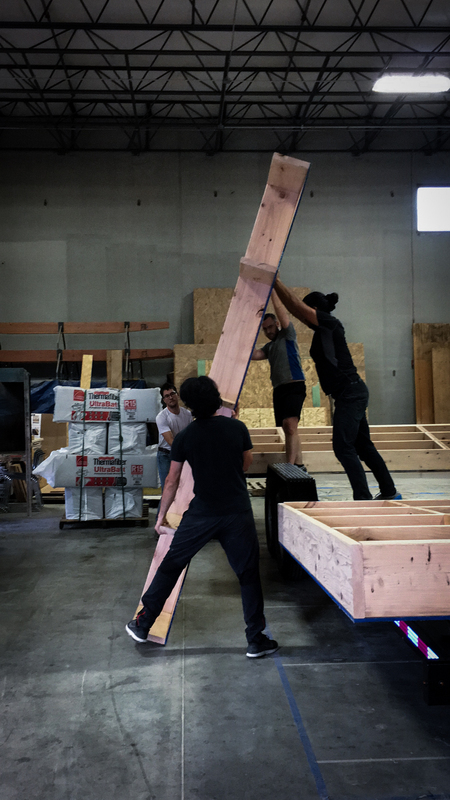 The framing of the raised floor system was our first true construction task for the tiny home. 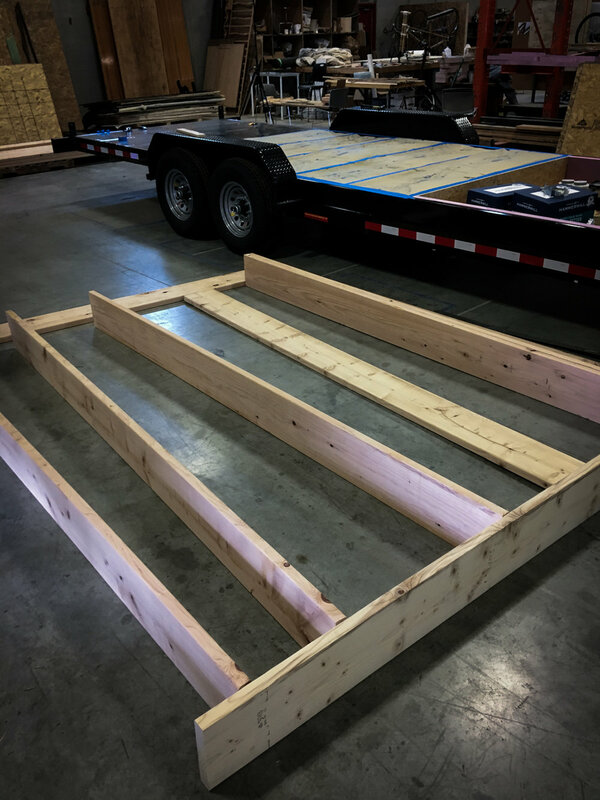 We went to Menard's and hand-selected each piece of 2x10" lumber for the beams and joists, each sheet of 7/16" OSB (oriented strand board) for the sheathing at the underside of the floor frame, and each sheet of 3/4" OSB for the floor finish. 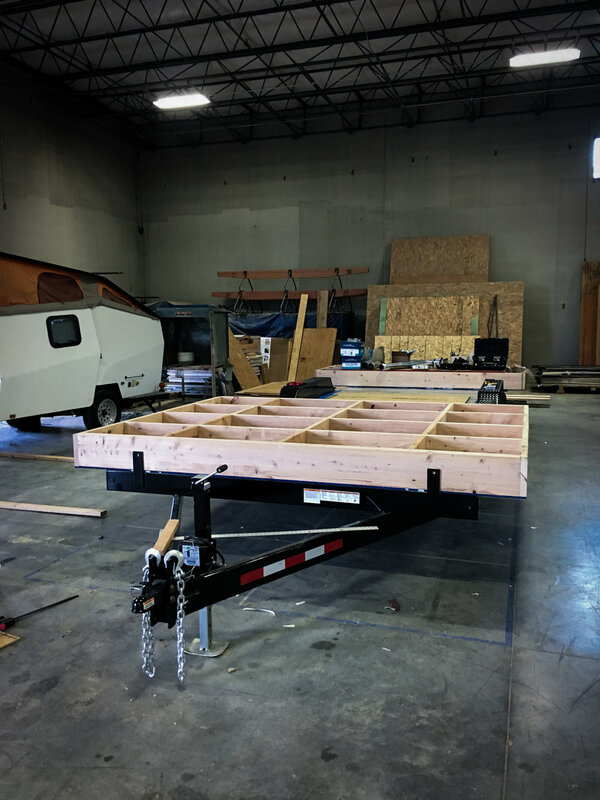 Our construction strategy involved building the entire floor framing in three large sections on the ground and then lifting them into place on the trailer frame, where the sections would be bolted to each other and to the trailer frame itself. 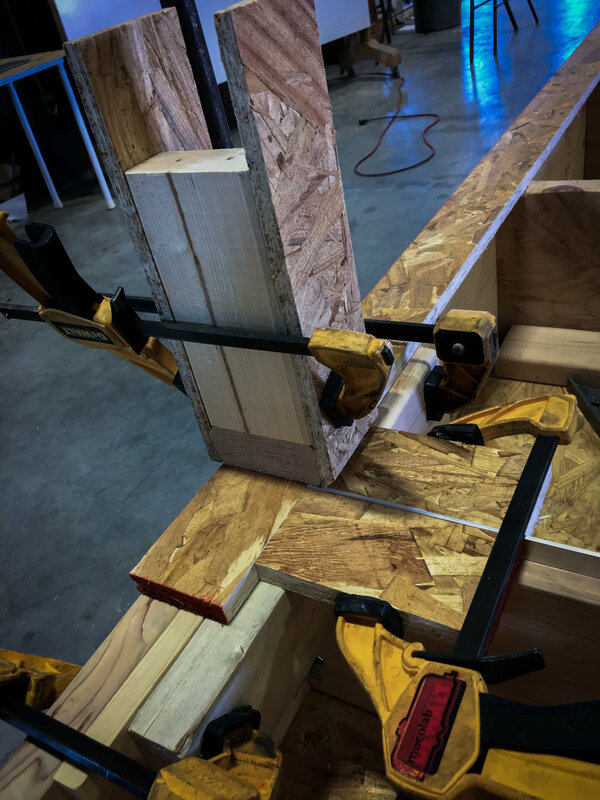 As shown in the series of photos in the blog post below, this strategy allows the framing to be easily maneuvered for squaring and nailing, and allows the underside sheathing to be screwed into place from above. As trained architects, we are very familiar with making precise and well-crafted objects, and we are reasonably familiar with power tools and the design and coordination of structures and systems; however, the framing of the first floor section proved that our familiarity with construction techniques and tolerances was considerably lacking. 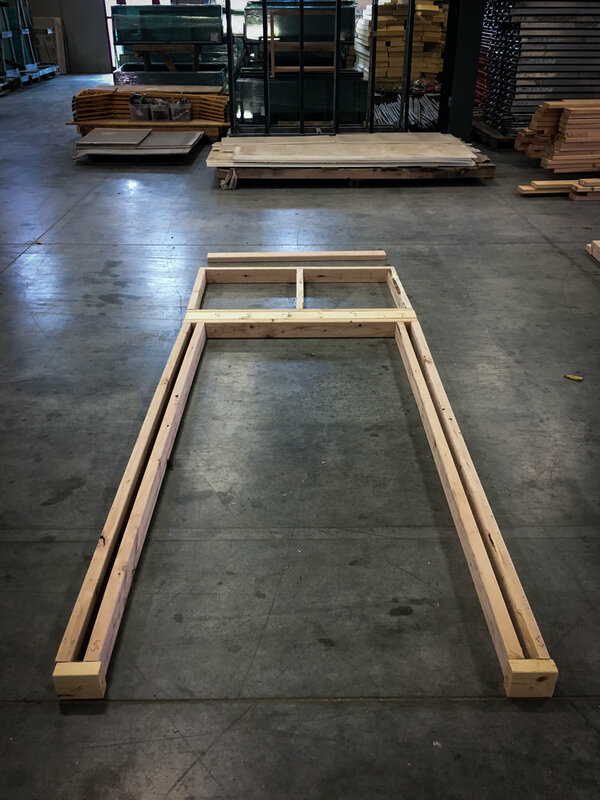 After all the framing lumber was cut to size according to our digital model, our first construction hurdle involved getting the framing squared. For this we ended up using a metal angle and some temporary bracing, as shown in the images above; the attachment of the underside sheathing, validated the squareness of the framing. 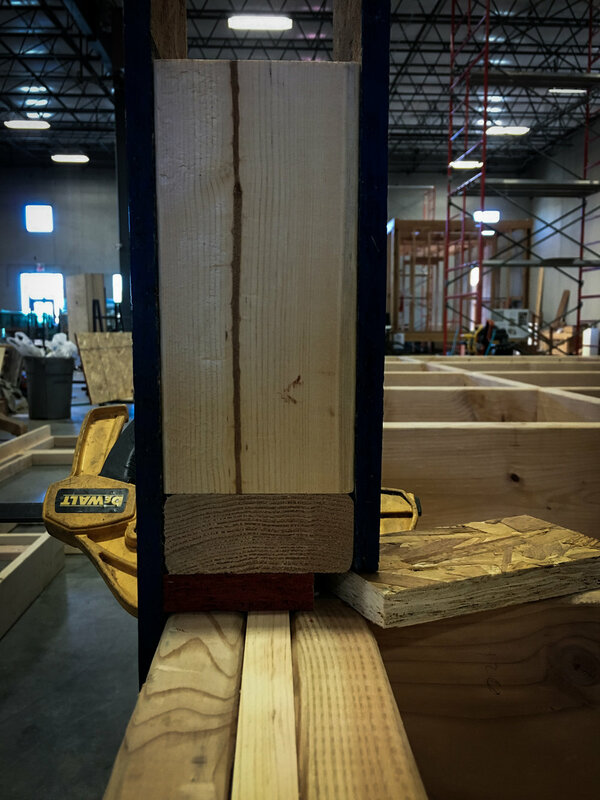 The 2x10" framing members were nailed together, while the 7/16" OSB underside sheathing was screwed onto the framing. 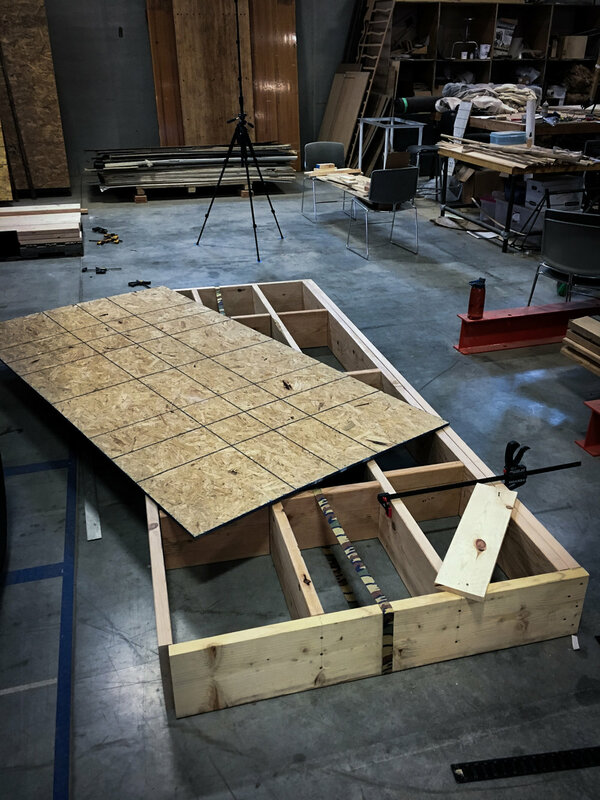 The construction of the floor framing involved basic tools, such as tape measures, pencils, metal angles, and clamps, and power tools such as a circular saw, table saw, nail gun, and drill. 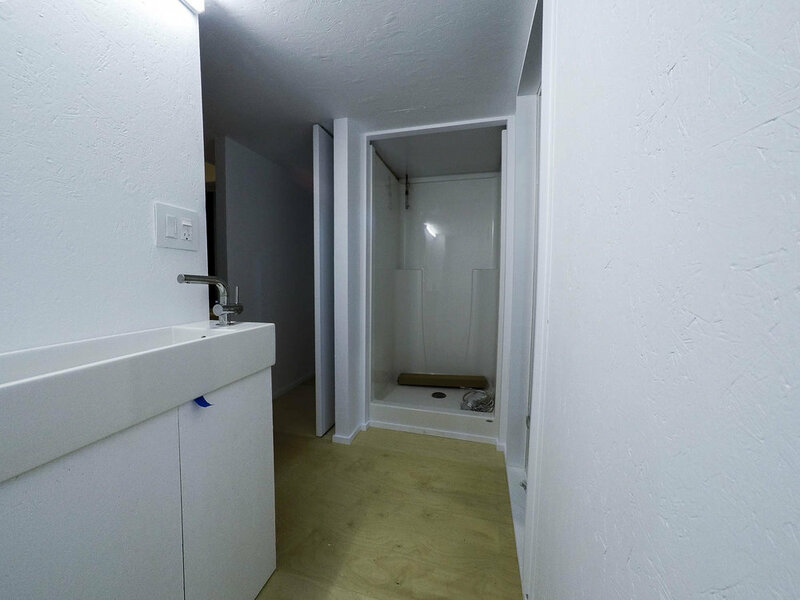 We first constructed the 4' bathroom section of the floor and then the 8' kitchen and entry section of the floor and lifted them into their respective locations at either end of the trailer. 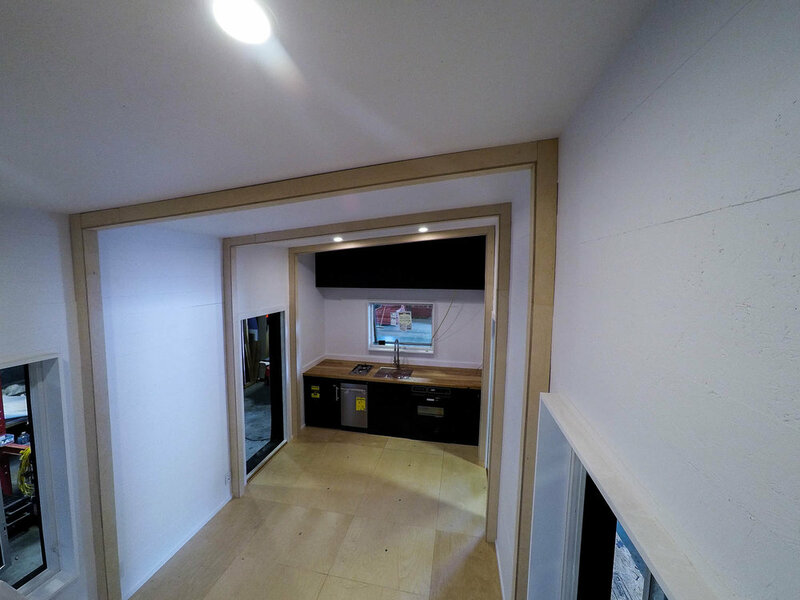 The 8' kitchen and entry floor section is shown in the middle two images above; the gaps in underside sheathing are for the water tank and battery bank storage compartments integrated in the trailer framing below the raised timber floor system. 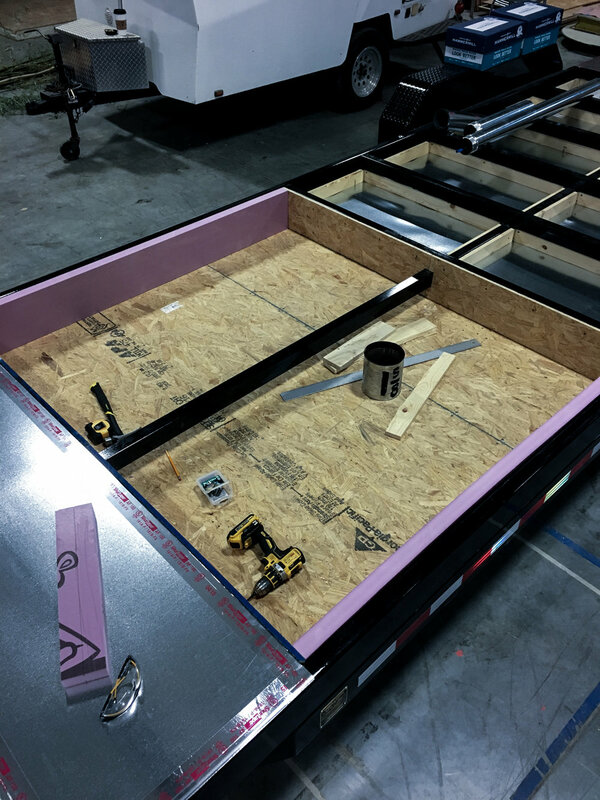 The three images below show the construction of the final 12' floor section at the center of the floor system where the trailer wheel hubs are located. The row of images below show the final 12' floor section being lifted and positioned onto the trailer. 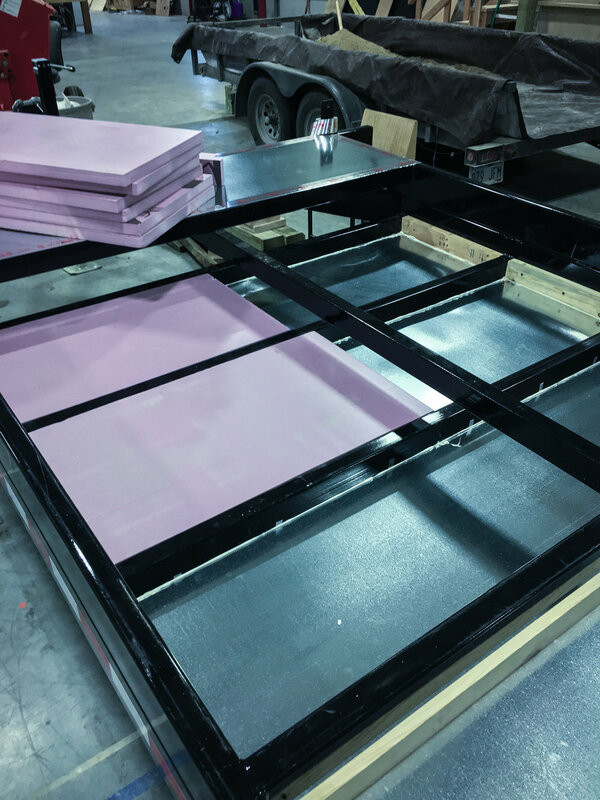 As made evident by the images, the floor sections were incredibly heavy and difficult to maneuver, requiring four people to relocate them from floor to trailer. After getting the final floor section onto the trailer, we found it impossible to fit all three sections flush on the top of the trailer. 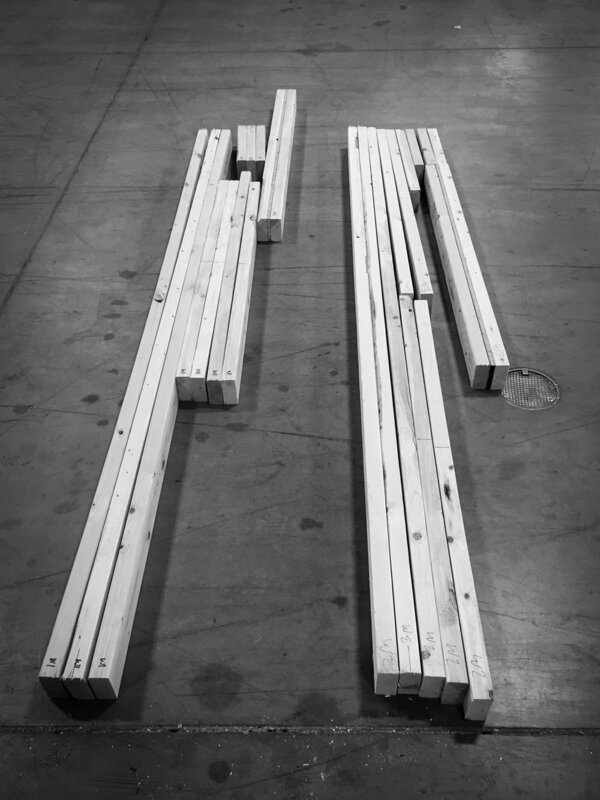 This was the result of measuring and building the floor system according to our digital model, rather from the measurements of the built trailer; the trailer apparently had a few dimensional discrepancies relative to what we had specified in our drawings to the trailer manufacturer. This resulted in two hours of four strong men forcing the floor sections into place via jumping and sledge hammering, as shown in the right-hand images below. While this was exceedingly frustrating, it was admittedly equally amusing. 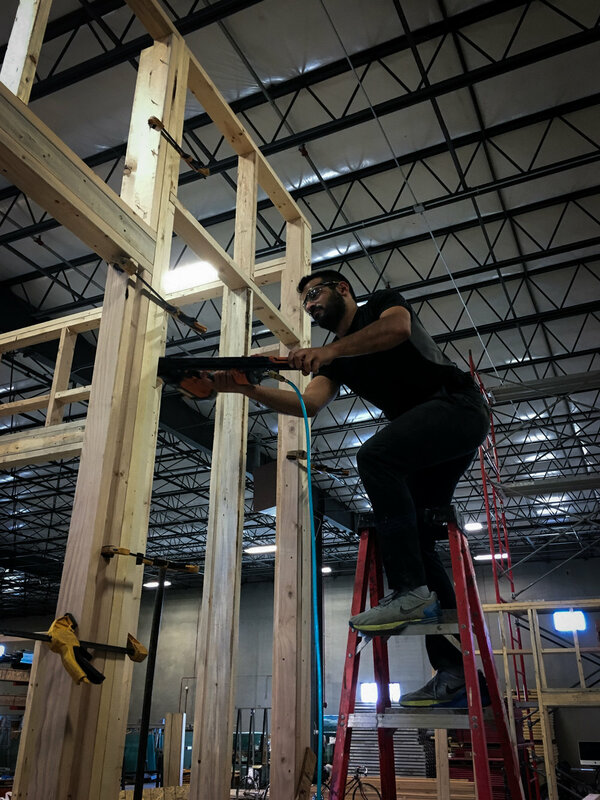 The biggest lessons learned in the framing of the floor were to check built dimensions, to build with tolerances, and that construction can be a bit messy and unpredictable, regardless of any amount of prior planning. 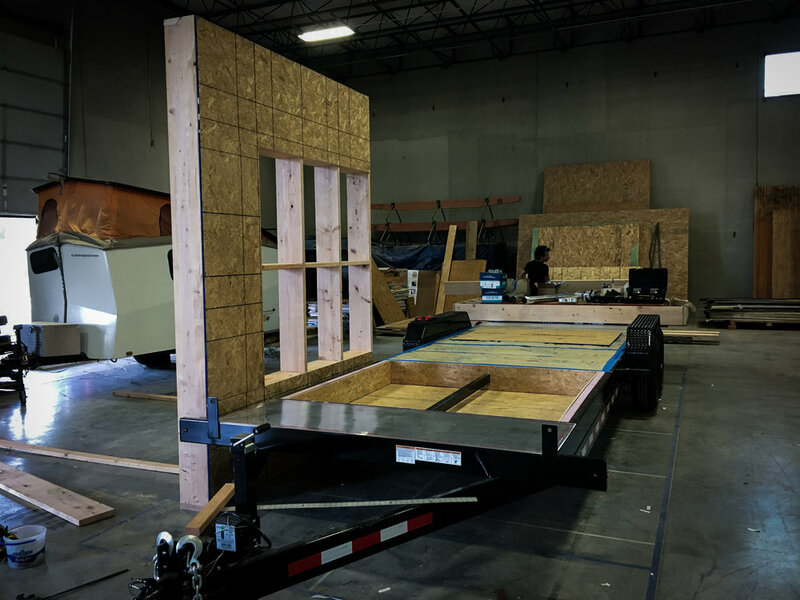 In the end, the floor framing was successfully installed, with each section squared and sitting flush against the trailer and against the adjacent section(s). 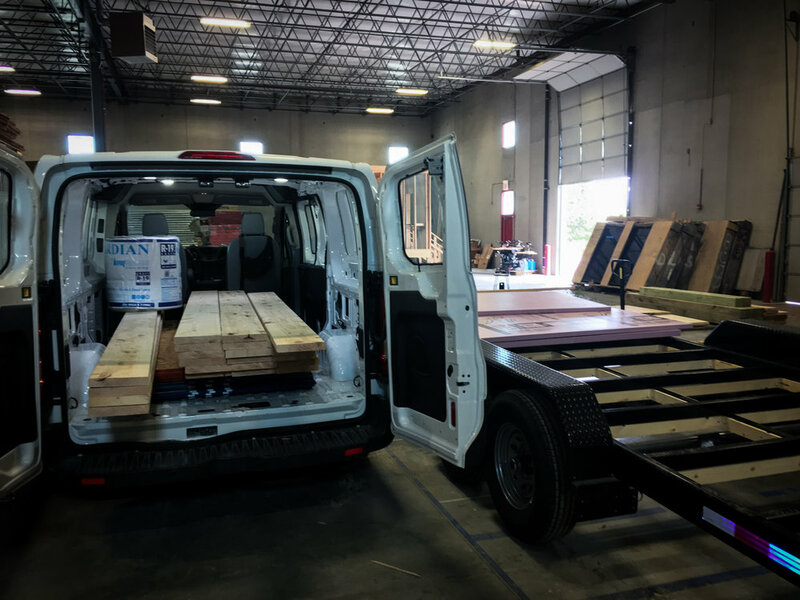 While some tiny homes opt to use the trailer framing itself as the floor framing, we chose to employ a raised floor system for a few reasons. 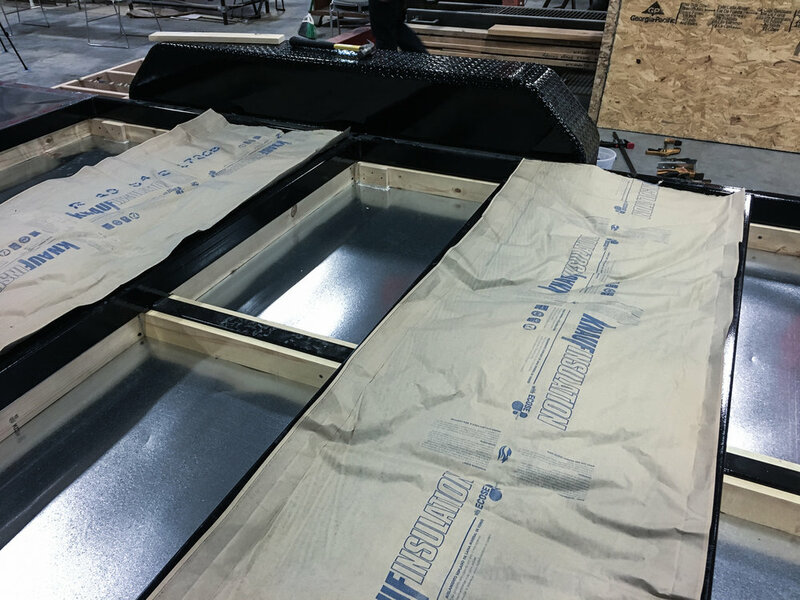 Firstly, a raised floor system allows us to route plumbing and electrical through it. Secondly, nearly half of our raised floor system serves as under-floor storage, with all compartments 9" deep, and typically 30x20" in length and width; the remaining raised floor system compartments are insulated, with insulation for the in-floor storage zones located within the trailer framing below. 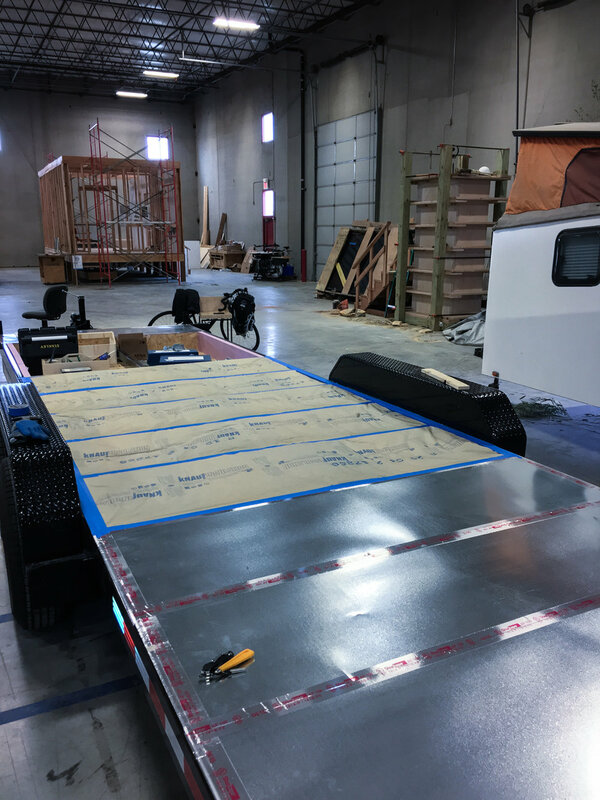 Finally, the raised floor system, which is flush with the top of the trailer wheel hubs, allows us to avoid the trailer wheel hubs as an eyesore and impediment to efficient interior space planning. The greatest setback to the raised floor system is that it reduces the clear height of the interior volume; if we had opted not to have a 10" raised floor, we could've likely gained 10" in ceiling height, which would've been an enormous asset in the lofted sleeping area. 75% complete. Raw steel, no paint. Ready for tiny home construction. 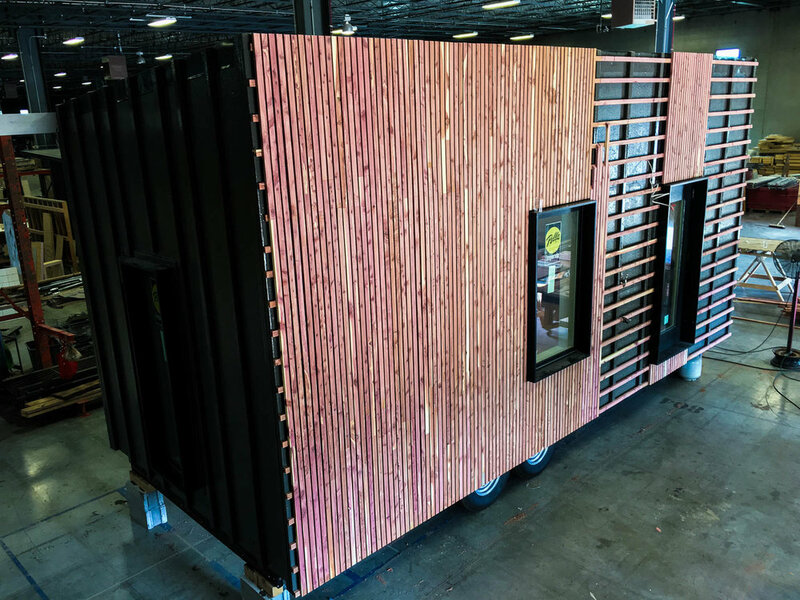 Seeing the custom-designed trailer in the manufacturer's yard was the first time the TINY HOUSE felt real. We stood there staring at the giant hunk of metal and thought 'what have we gotten ourselves into... we own this?'. Our trailer is now complete and in the warehouse. It took several months to design, a handful of visits to the manufacturer to red mark drawings, about six weeks to build, and cost $5,450. 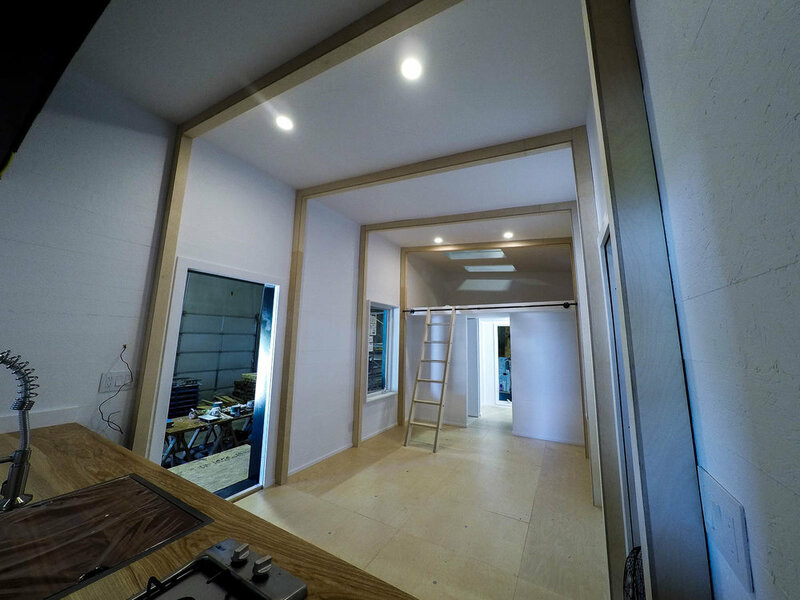 As our local manufacturer does not specialize in tiny house trailers, there are a few minor dimensional discrepancies that normally would not be problematic for their average client. 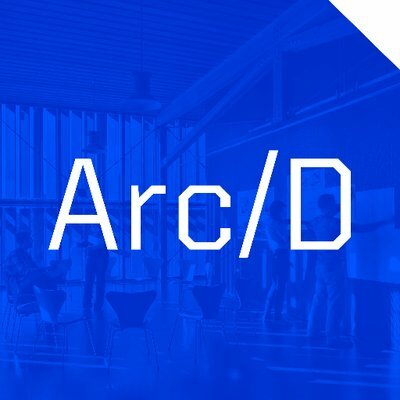 These discrepancies could likely have been avoided had we checked in with the manufacturer periodically to check progress and validate intentions. We can adapt to these, but they are considerable annoyances. Getting the trailer into our narrow slot in the warehouse was a challenge, as the common central 'alley' is sometimes congested and not very wide to begin with. However, some masterful maneuvering wrapped up the trailer manufacturing and delivery aspect of the TINY HOUSE. Now to make a trip to Menard's and begin fitting out the trailer! Warehouse 'alley' maneuvering. Thanks Ben!